Food Preservation Success. And Tofu. I’d read in one of my food preservation books that I could freeze eggplant. I was slightly curious while worried it would turn mushy in the freezer. I do make a few batches of eggplant parmesan every summer, popping leftovers in the freezer for winter consumption, but I had never put up plain eggplant. I decided to try it with one – if it didn’t work, no biggie. Freezing eggplant can not be easier. Slice it, blanch it by dropping it in boiling water for 4 minutes followed by putting it in a bowl of ice water for about the same time. Drain, stick in ziploc bags & pop in the freezer. Easy. I pulled out my bag of eggplant last week as I was attempting to make something other than soup for dinner one night. I briefly defrosted about half of the eggplant, then roughly chopped it & threw it in the pot. I can report that the eggplant did not turn mushy, but in fact, held up fairly well. Success! Now that I know I can freeze eggplant, I’m definitely going to take advantage of this process. We are fans of the vegetable, but to throw an entire eggplant into a dish can sometimes be too much of it. Throw half in, you still have to come up with another use for half an eggplant – even if you buy some of the smaller varieties – which can leave some members of this household feeling like we’ve eaten nothing but eggplant all week. This knowledge is a huge breakthrough in my approach to eggplant. Not only can I take advantage of it’s fantastic prices during the season, I can take better advantage of the wide variety available at the market during the season and have quite the stash of eggplant in the freezer. Yes! 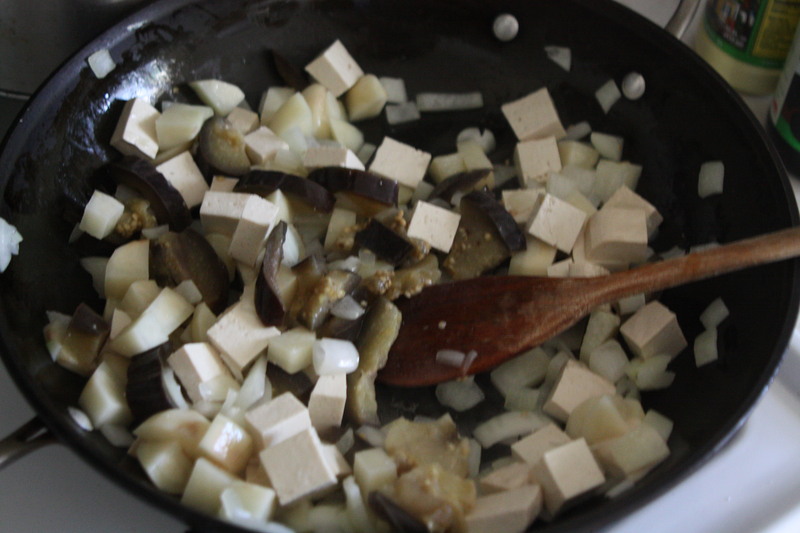 Eggplant for a pop of color among onions, potatoes & tofu. 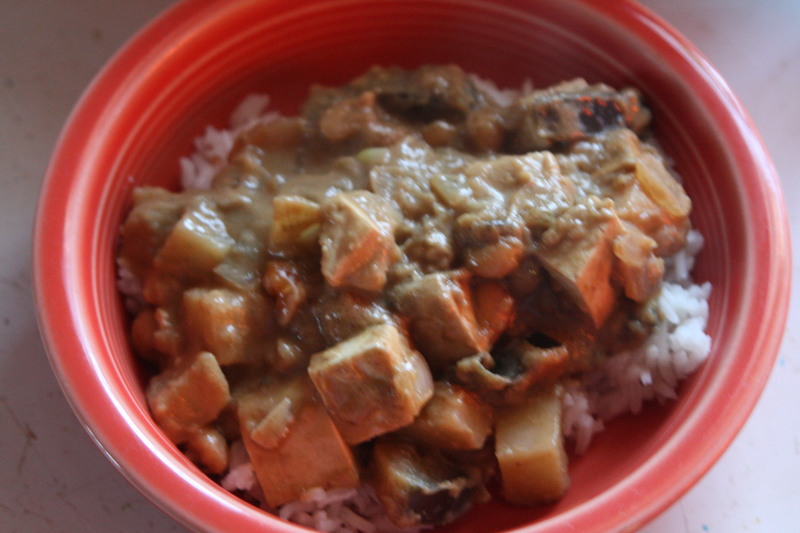 The dish I made with the eggplant in question was a thai green curry from my much loved “Tofu for Health Cookbook”. I picked this gem up at a Green Valley Book Fair sale for a song. It’s hands-down my favorite tofu cookbook, if only because it has such great curry recipes from all over Asia. This is not a vegetarian cookbook, as most of the recipes pair tofu with some sort of meat or seafood, although it’s easy enough to omit them from many of the recipes. In fact, the recipe I made that I’m about to share with you called for chicken that I left out. I always use Twin Oaks Tofu, which is made locally. According to their website, it’s available at most Whole Foods east of the Mississippi. It is unlike the tofu you tend to find at the grocery store. Track it down. I mean it. It’s amazing. It’s firmer than any other tofu I’ve encountered – there is no need to press it or boil it or freeze it or do any of those other tricks that tofu requires to firm it up. It’s just that firm. And they don’t use genetically modified soy. It’s the best tofu on the market. 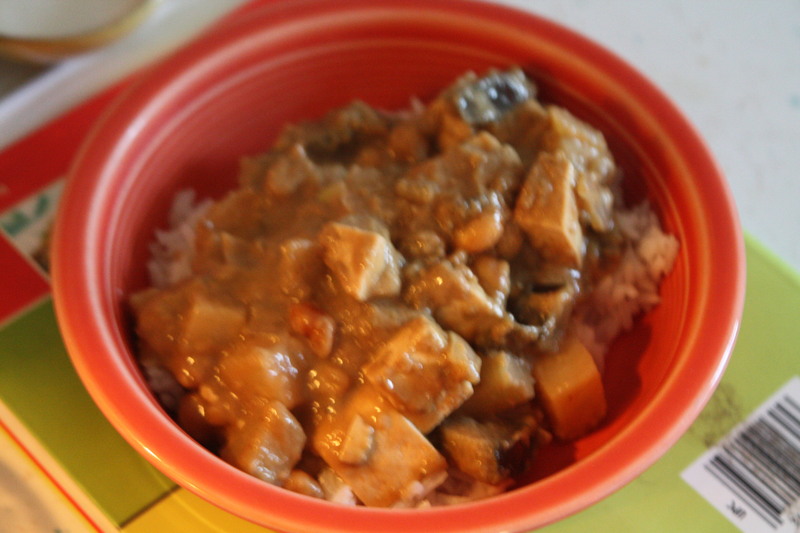 You can simmer it in a recipe such as this with no prior effort and it won’t fall apart. Get yourself some if you possibly can. I guarantee it will convert you. Tofu, potatoes & peanut sauce are just not that colorful when it’s all said & done. They taste fantastic though. One last word on the spice of this dish – I cut it in half from the original recipe. At the amount I used (a tablespoon), I found it to have a kick that was just right. Baby bear found it too spicy, while Papa bear found it not spicy enough. All we needed was Goldilocks to wander through as we sat there comparing notes on dinner. Otherwise, this dish was a hit with everyone – quite possibly because it wasn’t soup. Heat oil in pan over medium heat. Sauté onion briefly. Add potatoes & sauté for 5 minutes, stirring occasionally. Add eggplant, stir well & sauté for 5 minutes more. Add the tofu, sauté for a few more minutes. Stir in curry paste, lime juice, ginger & nuts. Cook for 2-3 minutes. Add remaining ingredients & stir until simmering. Cover the pan, lower the heat & cook gently for 15 minutes or until the potatoes are fully cooked. Serve with rice, garnished with cilantro. It’s unthinkable to eat any tofu other than Twin Oaks. I like to eat a slice raw on toast with mayo and watercress. It really is unthinkable to eat any other tofu once you’ve had Twin Oaks.